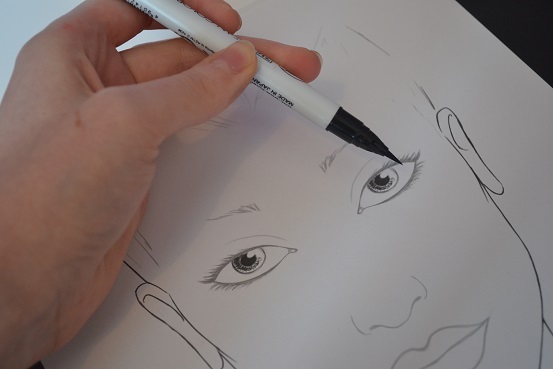 Hello lovelies, So the beginning of last week I asked on twitter if any one wanted to see a blog post on face charts and I got such a good response so thats what i'm doing today.... I was planning on putting this post up last week but its been hetick, so on friday when I was planning on doing this post I had work longer than I expected then when I got home we went out for dinner then when we got in I had to get everything ready for the next day as we had a wedding. on the saterday I was up at 6.30 to get ready for the wedding and to go over to the brides house and do the wedding partys hair and makeup, then went to the wedding and was at the venue untill midnight then yesterday i sleped then went car booting then watched a movie with my family. busy busy busy but im back now ready to right this post for you. Ohhh and before I start I just want to say a huge thank you to all my followers for there support, I reached 1000 followers which is crazy to me, it meens the world and there will be a giveaway comming soon when I manage to find the item I want to giveaway in the shop. 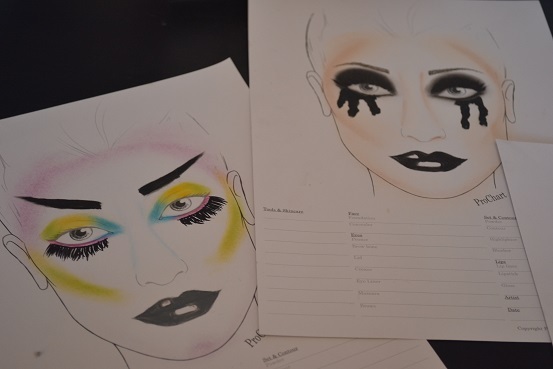 Face charts are disigned for mostly for makeup artists, there used for a mixture of things from when your board and want to create a look, preperation for a shoot or just when somthing pops in to your head and instead of righting it down to actully do the makeup on the charts. I personaly find face charts very helpfull and fun, you may know that I have dislexia so when a photographer/ model askes we what I have planed or want to do in stead of trying to explane through words which I find hard I show then a face chart. I also find face charts really great for my creative side, as a makeup artist I have to be creative as I dont want my work to be the same as everyone elses. 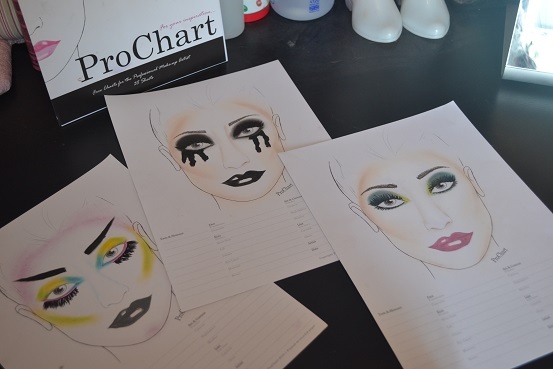 The face charts I use are called pro charts and they come in different sizes, I have the A4 full face charts but you can get eye charts and also A3 full charts as well. 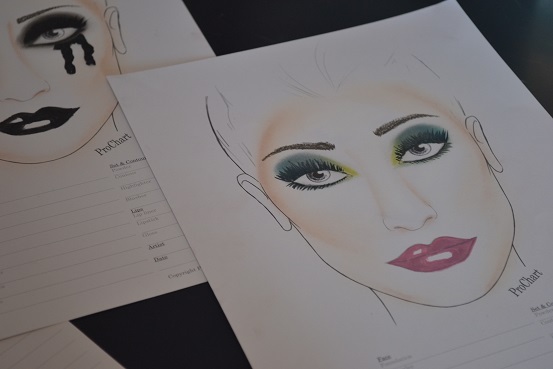 These are a few of the face charts I have resently come up with these are for shoots this month so a sneek peak for you. alot of people ask me what to use on face charts wether they should use coloring pens/pencils or use actual makeup... 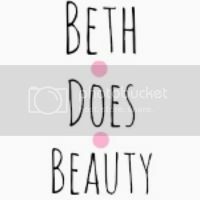 I always anser to use actual makeup as I think it gives a better effect and when you go to actually do the makeup then you know exactly what products to use. 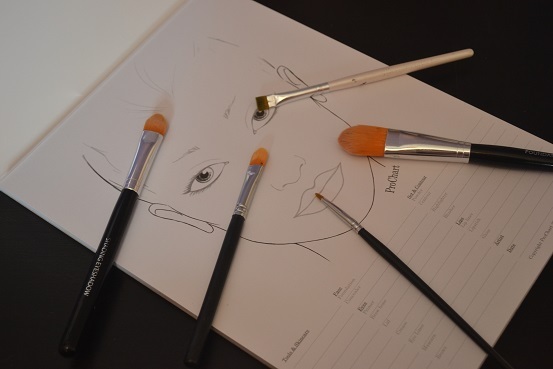 when doing face charts it is always best to use flat brushed as fluffy brushes are not going to apply the product to the flat paper. Flat brushes are dence so you can press the product on to the paper so you could use flat foundation brush which I use to apply a face powder to the areas of the face that need to stand out more I leave the areas that ushaly get highlighted whight then I take a flat conceler brush and use a contore product to sculped the areas that are ushaly contored so the temples the cheek bones the jaw and the sides of the nose. then with a flat eye brush apply eyeshadow. for the brows I ushealy use a eye brow pencil as it looks more realistick. for the lips I just use a normal flat lip brush. eyelashes are somthing people tend to have problems with on face charts but pro charts actully sell the perfect solution to the problem they sell the eye lash pen. it is so easy to use and makes drawing eyelashes amazing. you can also use this pen for eyeliner or black brows. one more tip before I go, dont apply gloss to these face charts as it wont look nice and glossy, if you want the lip to look glossy leave holes were you would apply lip stick and top off with a top coat nail polish. so if you want any more info or tips on face charts all you have to do is ask.